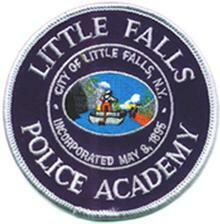 Chief Gregg A. DeLuca created the Little Falls Police academy in 1997. The academy operates when a need from other agencies is identified. To date, we have trained over 100 police officers and sheriff deputies from the Counties of Herkimer, Oneida, Madison, Montgomery, Fulton, Albany, Saratoga, and Onondaga. Most Recruits that attend this academy juggle full time jobs and family life while enduring the strict, paramilitary academy setting. In addition to the Basic Course for Police Officers, the academy administers the Phase II Course on a yearly basis. The Little Falls Police Academy has also hosted the Pre-Credentialing Program through Cazenovia College since 2004. This Phase of the pre-credentialing process provides students with most of the academic portion of the academy as students of the college. Once that program is completed, the student is eligible to be hired by a police agency and will then go through the second phase of training, which consists of more police-specific training such as firearms. The academy has brought many people to the Little Falls area and continues to support the department's hiring needs from proven, sound candidates.